(Omaha, NE) — Clean out your closets now!!! Share your “Coats, Gloves & Love” with those less fortunate. Elk Creek Crossing’s Annual Clothing Drive runs – Thu-Sun. Nov 5th-8th. 9a-5p. With kindness & sweetness in your heart. Please drop off coats, gloves, boots, sweaters, blankets & such inside bins at 16508 Taylor Street. Or, ring the door bell of this residence – if bins over-fill and/or after-hours. “We’re going to give these nice clothes away to an Omaha group that would really benefit, like an abused women’s shelter or similar organization” notes co-organizer Susan Stern, who hosts this year’s drop off locale. Social Committee Chair Karen May is handling signage. 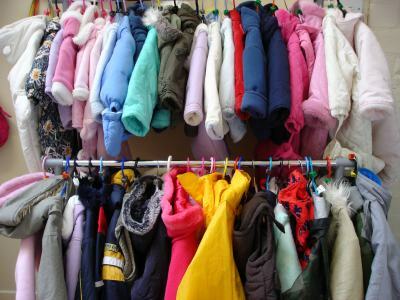 Kudos to ECC residents Angie & Barry Emerson who out of the kindest of their hearts, donated close to 10 warm coats! With smiles on their faces, three of their children dropped off the coats on Friday! What a surprise. Thanks Emersons! Previous Annex – More $$ or Not? This webmaster encourages residents to post comments! Your community involvement is fantastic.